Four Seasons Hotels and Resorts will open its Beirut property on December 7. The hotel has been planned for several years but development of the new-build was disrupted over the past few years because of political unrest in the region, most recently last year. But Simkovics was positive about Lebanon’s future. “Everyone knows the country is beautiful and so everyday of stability creates more positive attention,” he said. The luxury hotel, which is located 15 minutes from Beirut Rafik Hariri International airport, near the marina, has 230 rooms, including 60 suites, all with private terraces. The curved shape of the property means that 70 per cent of the rooms have views of the Mediterranean sea, while the rest have views over the old city. “Guests are encouraged to step out and enjoy the sea air, sunset, Mediterranean views and the sights and sounds of this cosmopolitan city,” Simkovics said. The hotel’s restaurant is the Grill, which will serve Mediterranean cuisine and a seafood grill menu. There’s also the Lounge, which offers Lebanese and international cuisine around the clock. For drinks there’s the Boulevard cocktail bar, the Bar for a selection of whisky and cigars, and rooftop bar Club26. The property will have several spaces for meetings and events, including a ballroom and a terrace for break-out gatherings. There’s also a spa with seven treatment rooms, one of which is a couple’s room with its own private terrace with sea views. The 26th floor has a glass-covered pool. In May next year, the hotel’s Sky lounge – an urban cocktail and tapas offering – will open to any guests or members of the public who have made a reservation. Gordon Campbell Gray, of London’s One Aldwych, opened Le Gray in Beirut earlier this year, and Rotana recently announced its third hotel in Lebanon, Raouche Arjaan by Rotana. 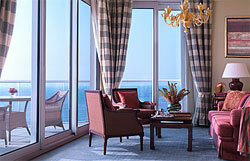 Visit fourseasons.com/beirut for more information.